Bratislava lies at the southwestern edge of Slovakia, a few minutes’ drive from Austria and Hungary. On both banks of the Danube River, and close to the Carpathian mountains, Bratislava is the largest city in Slovakia and its capital, population 450,000. Bratislava is one of the youngest capitals in Europe and few people know that during the time it was called Pressburg or Pozsony it was one of the most important cities in the Austro-Hungarian Empire. It was a mixing point of various nations and nationalities who lived together in peace and harmony. Nowadays Bratislava is experiencing a boom once more. Buildings are popping up, deals being made, people studying, and everything is on the move. Experts regard it as one of the most dynamically developing and most prospective regions in Europe. It welcomes tourists, business people, and investors, who are attracted to this blooming city and its lively atmosphere. There are many cities in Europe that can boast their own special unique charm, and Bratislava is definitely one of them. Often referred to as an upside-down table, Bratislava Castle is certainly unique with an original design that is unmistakable. Parts of the castle are open to the public, and contain exhibitions of the Slovak National Museum. There is a very good exposition on the History of Musical Instruments, as well as a historical furniture exposition and a collection of exhibits called 'The Jewels of Slovakia's Remote Past'. 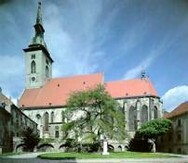 The biggest, oldest and finest church in Bratislava, St. Martin's Cathedral was built in the gothic style in the C14th and C15th. It was here, during the time when Bratislava was the capital of the Kingdom of Hungary, that a series of Hungarian Kings and Queens, including Marie Theresa, were crowned. Devin castle is situated 5 miles West of Bratislava on the Danube and just a stone throw away from Austria. The castle was destroyed in 1809 by Napolean's army, and today lies in ruins. Near the castle is a memorial to Ludovit Stur, who fought for Slovakian independence from Hungary, and made Devin Castle a symbol of Slovakia's glorious past.